I decided to post this look! Nothing really special, but still I was trying my new products I bought in Germany/Holland. 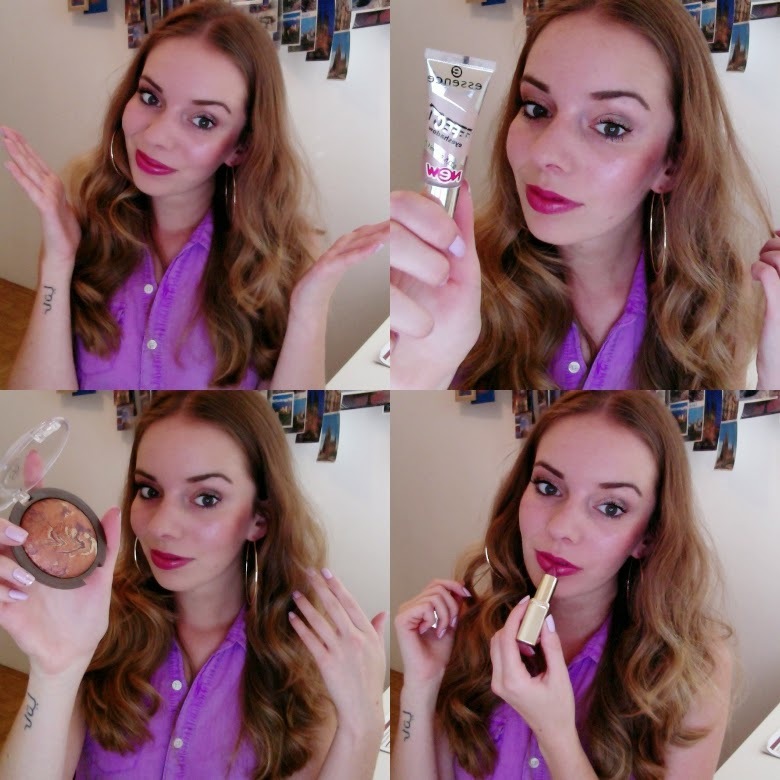 Rival de Loop bronzer - Can you believe it? I never had bronzers. Only blushes, highlighters - and now I'm so excited to use it. It's so pigmented that I really need to be careful! But I really like this summer glow! L'oreal Paris lipstick - Oh. I love those lipstick. Formula, smell - L'oreal I adore you. (after those photos were taken my mother took this lipstick for herself :( But still - I think this colour is gorgeous. Essence new eye shadow - Totally pigmented, creamy eye shadow from Essence! It is not in Slovenia yet, but I really like it. I combine also some others but this one really looks nice. Even if I really don't like Essence's eyeshadows, this one rocks! I'm glad I found your blog!!!! I hope you can visit my blog sometime!! Great!!! I just followed you on GFC!!! Waiting for you to follow back!! Barva šminke je res krasna! Ampak bronzer - ne zameri. Mogoče izgleda tako samo na fotografijah - kot da imaš odrgnino. Mogoče ne bi smela toliko pretiravati z nanosom.